Kathy Geiss is Don Geiss' daughter. She is somewhat pudgy, red-faced, and 40-something years old. She has an affinity for unicorns and Mark Wahlberg and really enjoys soap operas. She has been shown putting toy race cars in her mouth, eating flowers, and demonstrating an impressive vocal talent, in homage to Susan Boyle. She rarely ever speaks, however, she speaks three simple one-word phrases "kiss kiss kiss" in the episode Do-Over. During the time her father, Don Geiss, was in a coma she held the title of Chairman and CEO of GE and President of East Coast Television and Microwave Oven Programming, however she was more of a figurehead, as her fiance, Devon Banks, called most of the shots. She made Jack her chief business advisor after a soap opera-style twist with Liz, replacing Devon. 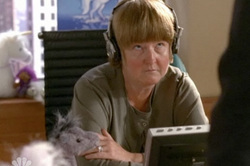 Kathy Geiss is portrayed by Marceline Hugot.